Force Delta carries out the security guarding of its sites by means of armed and trained officers in uniforms. All guarding personnel have passed physical and psychological fitness tests as well as training courses in first aid rendering, counter-fire, emergency safety and actions upon terrorist threat. The security supervisors periodically carry out instructions and examinations on response in emergency cases, rehearsals of the time needed for response upon alarm activation as well as testing of the acquaintance with the particular region subject to response. Check-ups of the physical training, specialized driving, etc. are regularly carried out. Each patrol consists of at least two guards, one of them having a command of English on a working level. The security guarding is carried out by means of patrolling motor vehicles of the company supplied with Icom radiostation sets. 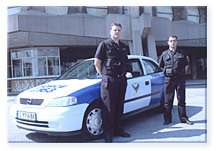 All patrol motor vehicles are designated with the distinctive insignia of the company. After receiving an alarm signal in the <?xml:namespace prefix = st1 ns = "urn:schemas-microsoft-com:office:smarttags" />Security Operations Center, the operator on duty sends through radio-connection a response emergency signal to the closest auto-patrols. At the same time, by means of the paging system, the auto-patrols receive the response signal as well as additional information concerning the particular site. The response teams realize a response reaction to any alarm signal or need of urgent assistance. Upon receiving a signal, the operators send at least two response teams. Every single response unit consists of a guard-driver and a security officer. All teams are equipped with pistols, Mozberg rifles, portable radios, bullet-proof jackets (designated with the company symbol), searchlights, clubs, hand-cuffs, company ID cards and other accessories. Force Delta has insured all of its patrolling vehicles, including their seats.